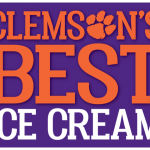 CLEMSON, SC — Clemson University has dished out the scoop on a new dairy brand, and McLeod Farms is a major contributor. 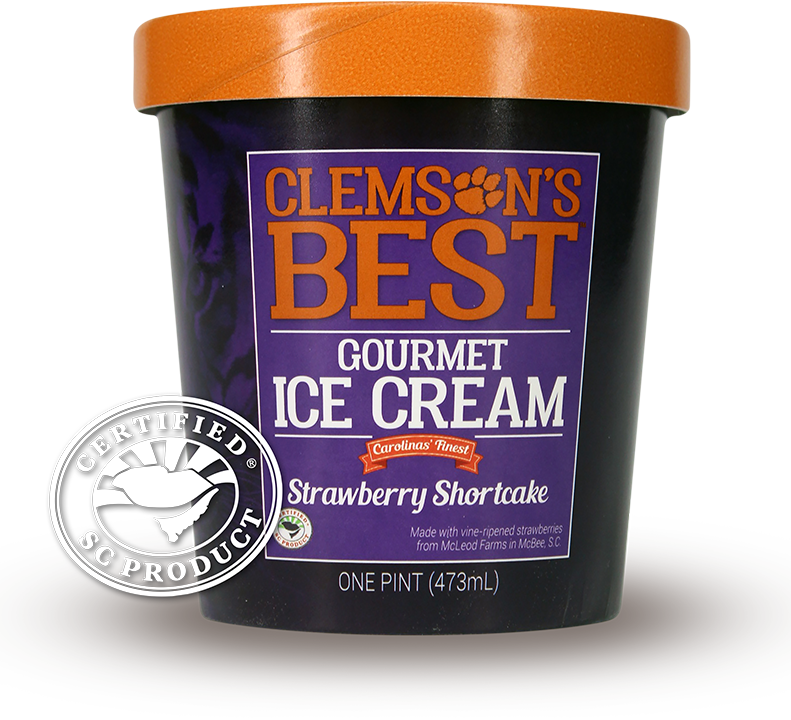 CLEMSON’S BEST™ gourmet ice cream is available in select Ingles Markets with other outlets expected to follow. The McLeods have joined three South Carolina families to bring consumers a Certified South Carolina-grown product and a true taste of home. Farms in Edgefield and Ridge Spring produce the milk, peaches and pecans. Strawberries come from the McLeods. Ingles is the first regional supermarket to carry CLEMSON’S BEST™, easily recognized by its purple label. Pints are available in 109 stores throughout South Carolina, North Carolina, Georgia and Tennessee. Negotiations also are underway with Lowes Foods, Food Lion and Bi-Lo, already a big supporter of the Clemson Tigers, particularly in the Upstate. Brand officials also are working with private-label retailers that already sell Clemson Blue Cheese, the university’s first dairy product. It has developed a tremendous fan base since 1941, when Professor Paul Miller discovered the Stumphouse Tunnel near campus created the perfect environment to age cheese. For the university’s newest gourmet product, small-batch ice cream maker Greenwood Ice Cream worked directly with the university to handcraft four Southern flavors. One is vanilla “but not just any vanilla,” said Hickory Hill’s Watson Dorn, whose Holstein cows produce milk ultra-rich in butter fat for the wildly popular Clemson Blue Cheese. “Don’t expect anything skinny under the lid, though — just a spoonful of good from some of The Carolinas’ best farmers.” Hickory Hill Milk also is non-homogenized, a rare find these days and a nostalgic return to times when a thick layer of cream rose to the top of each bottle. That’s what also makes the new vanilla confection “an unbelievably creamy, nostalgic ice cream like Grandma made,” Dorn said. Other flavors include Caramel Butter Pecan, Peaches and Cream, and Strawberry Shortcake, so far the second most popular flavor, according to sales receipts. Ten percent of the proceeds from CLEMSON’S BEST™ fund student-related learning, including scholarships, internships, research and campus programs in the College of Agriculture, Forestry and Life Sciences. Clemson’s legacy had once belonged to Vice President John C. Calhoun, whose daughter married Green, an engineer, musician and artist. Bibliographers have written that Clemson wanted to start an agricultural college because he felt government officials did not appreciate the importance of agricultural education. Clemson Agricultural College opened in July 1893 with 446 students. They were the first class to learn the college’s concept of paying forward and giving back. 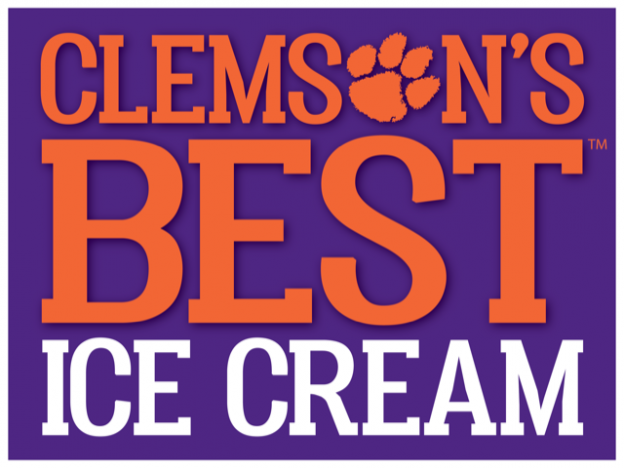 For more information, visit http://www.clemsonsbest.com. 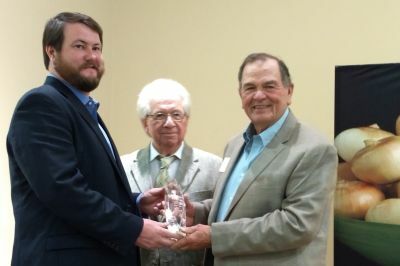 Executive Director Bob Stafford and R.T Stanley Jr.
R.T. Stanley Jr., a longtime member of Richter and Co.’s family of farms, is the latest inductee of the Vidalia Onion Hall of Fame. More than 200 guests watched him receive the top honor in February during the Vidalia Onion Committee’s 2018 awards banquet that also celebrated the onion’s official trademark nearly 26 years ago. The actual industry traces its roots to Toombs County, Georgia. In the 1930s, weather there wiped out the state’s regular onion crop, and a train car full of seedlings from Texas shipped to Georgia just in time. Those onions were sweet, though, and most farmers scratched their heads, worried that what they grew might not be fiery enough for local taste buds. Luckily, Piggly Wiggly customers fell in love, kindling a new romance with the onion grown only in 20 South Georgia counties. Appreciation for the Vidalia spread slowly across America, and today it is a No. 1 pick of chefs and home cooks around the world. R.T.’s family lives in Toombs County, home of Vidalia — one of two top-producing onion counties in the Vidalia growing region. Junior began farming Vidalias with his father, Rodney Taylor Stanley Sr., in the 1980s, when the onion first became a household name. Many considered their willingness to abandon tobacco, a more “traditional” crop, for Vidalias a gamble at best. But rolling the dice forever changed the Stanleys’ farming operation and made them pioneers in the sweet onion market. R.T. was among the core group of Vidalia farmers who fought to attain legal status for the onion, clearly defining its growing region and getting the name Vidalia trademarked. He also fought for the Vidalia to become Georgia’s official state vegetable. Today, Vidalias aren’t just another Southern something, like grits and sweet tea. They are sold in 50 states and parts of Canada. R.T. is retired from the Vidalia, Ga.-based Stanley Farms, where he served as president. His farm life began in 1964 as a sharecropper, and when R.T. acquired land of his own in 1975, he planted 5 acres of Vidalias. In 2016 Stanley Farms merged with Coggins Farm and Produce to form Generation Farms, the largest grower, processor, packer, and shipper of sweet onions on the East Coast. 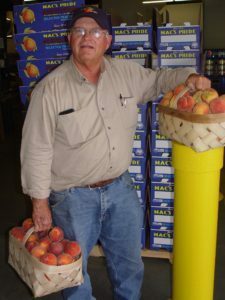 The Packer — Profiles in Produce: R.T. Stanley Jr.
Kemp McLeod has been named South Carolina Farmer of the Year. He now joins nine finalists throughout the state, all hoping for the distinguished Southeastern Farmer of the Year. Should that happen, McLeod would be one of only three South Carolina winners in the 28 years the award has been presented. For winning at the state level McLeod, a longtime peach farmer from McBee, will receive cash, prizes and an expenses-paid trip to the Sunbelt Expo farm show in Moultrie, Ga., where the Southeastern Farmer of the Year Award will be given on Oct. 17. 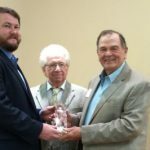 Tony Melton, a Clemson Extension horticulture agent in South Carolina’s Pee Dee region, nominated Kemp for the award sponsored by Swisher Sweets and the Sunbelt Expo. “He is the best farmer I know,” said Melton, who worked for McLeod Farms in his youth and used money he earned there to attend Clemson University. Years later, The McLeods honored Melton by funding a Clemson scholarship in his name. Previous state honors given to McLeod include the John W. Parris Agriculture Leadership Award, the Order of the Palmetto in recognition as a Century Farm for operating more than 100 years, and an honorary state future Farmers of America degree. Although peaches are their No. 1 crop, McLeod Farms — voted South Carolina Farm of the Year in 2011 — doesn’t stop there. They have a sizeable business in corn, wheat, rye and soybeans and a retail store that is a favorite stop for folks headed to and from South Carolina’s beaches. They also grow strawberries, blueberries, blackberries, red potatoes, cabbage, sweet corn, squash, onions, bell peppers, okra, tomatoes, peas, pumpkins, turnips, egg plants and other produce that’s sold at their roadside markets.